This set of Wireless & Mobile Communications test focuses on “Statistical Models for Multipath Fading Channels”. 1. Which of the following is not a statistical models for multipath fading channels? Explanation: Several multipath models have been suggested to explain the observed statistical nature of a mobile channel. Clarke’s model for flat fading, Saleh and Valenzuela indoor statistical model, two ray Rayleigh fading model are some of the statistical model for multipath fading channels. 2. Who presented the first statistical model for multipath fading channel? Explanation: The first statistical model was presented by Ossana. It was based on interference of wave incident and reflected from the flat sides of randomly located buildings. Ossana model predicts flat fading power spectra that were in agreement with measurements in suburban areas. 3. Clarke’s model assumes a horizontal polarized antenna. State whether True or False. Explanation: Clarke developed a model where the statistical characteristics of the electromagnetic fields of the received signal at the mobile are deduced from scattering. Clarke’s model assumes a fixed transmitter with a vertically polarized antenna. 4. A wave that is incident on mobile does not undergo Doppler shift. State whether True or False. Explanation: Every wave that is incident on the mobile undergoes a Doppler shift. It is due to the motion of the receiver and it arrives at the receiver at the same time. Therefore, there is no excess delay due to multipath for any of the waves. 5. Which of the following is an important statistics of a Rayleigh fading useful for designing error control codes and diversity schemes? Explanation: The level crossing rate (LCR) and average fade duration of a Rayleigh fading signal are important statistics. They are useful for designing error control codes and diversity schemes to be used in mobile communication. 6. The level crossing rate (LCR) is defined as expected rate at which _______ fading envelope crosses a specified level. Explanation: The LCR is defined as the expected rate at which the Rayleigh fading envelop is normalized to the local rms signal level. And it crosses a specified level in a positive going direction. Explanation: The level crossing rate is a function of mobile speed. Because, it is possible to relate the time rate of change of the received signal of the signal level and velocity of the mobile. 8. Clarke’s model considers the multipath time delay. State whether True or False. Explanation: Clarke’s model and the statistics for Rayleigh fading are for flat fading conditions. They do not consider multipath time delay. 9. Saleh and Venezuela reported the results of ______ propagation measurements. Explanation: Saleh and Venezuela reported the results of indoor propagation measurements. The measurements were made between two vertically polarized omnidirectional antennas located on the same floor of a medium sized office building. 10. Saleh and Venezuela show that indoor channel is _______ time varying. Explanation: The results obtained by Saleh and Venezuela shows that the indoor channel is quasi static or very slow time varying. It shows that the statistics of the channel impulse response are independent of transmitting and receiving antenna polarization. 11. What is the full form of SIRCIM? Explanation: SIRCIM stands for Simulation of Indoor Radio Channel Impulse response Model. SIRCIM generates realistic samples of small scale indoor channel impulse response measurements. 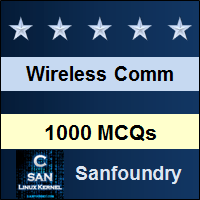 To practice all areas of Wireless & Mobile Communications for tests, here is complete set of 1000+ Multiple Choice Questions and Answers.